I love making up a batch of homemade pesto, it’s great to have on hand to throw on top of so many things! 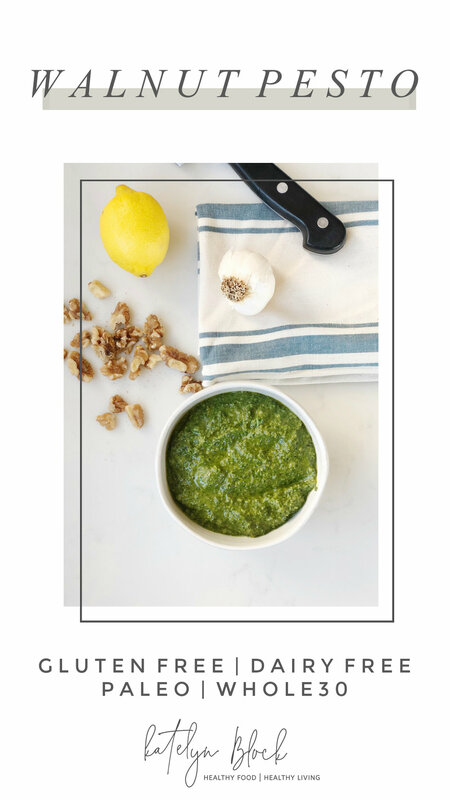 This pesto recipe is made with walnuts in place of the typical ingredient of pine nuts. Walnuts have a ton of health benefits, so I love using them in this recipe. There is also no dairy in this recipe, and I really don’t miss it. It’s still packed with lots of flavor from the fresh basil, garlic, and lemon! Great for topping your fish or chicken, throw it on top of a bowl of roasted veggies, or use it as a dip for raw veggies. Place all of the ingredients except the olive oil into a food processor. Place the lid on and begin pouring the olive oil through the hole in the food processor lid while blending the ingredients together. Pulse until smooth. You can add extra olive oil if needed. Enjoy! Store in an airtight container in the refrigerator if not using right away.